Here at Food52, we love recipes — but do we always use them? Of course not. Because once you realize you don’t always need a recipe, you’ll make your favorite dishes a lot more often. 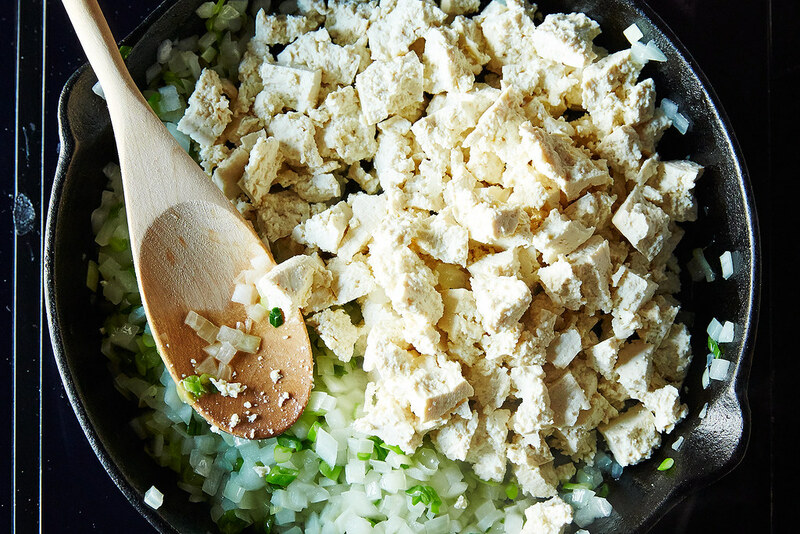 Today: A simpler way to cook tofu, for vegans and non-vegans alike. 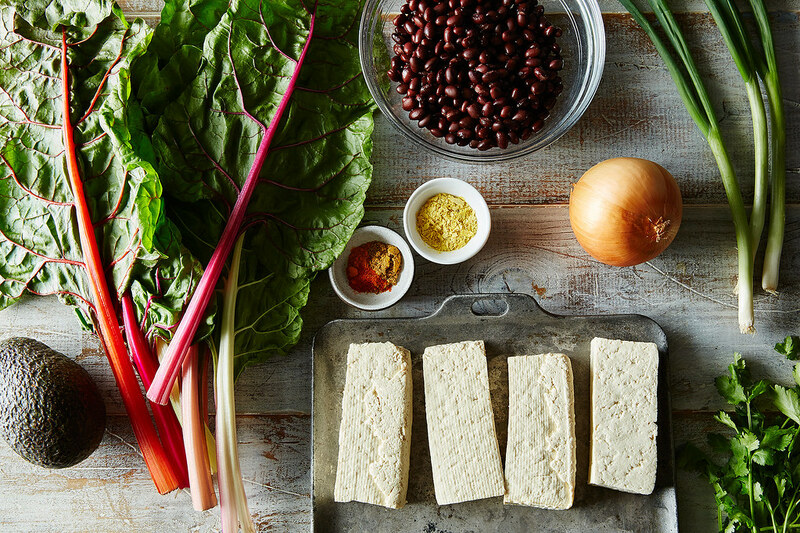 For all of the progress we’ve made demystifying tofu, there’s still a lot of obsessing involved when it comes to making it well. We’re told to freeze it, to deep fry it, to sear it, to press it, to grill it, to cover it in salt water, and to melt it slowly into fudge. But these seemingly limitless possibilities can often be more stressful than exciting. Sometimes — and particularly in the morning — we don’t have the energy to persuade tofu to become a more desirable texture. 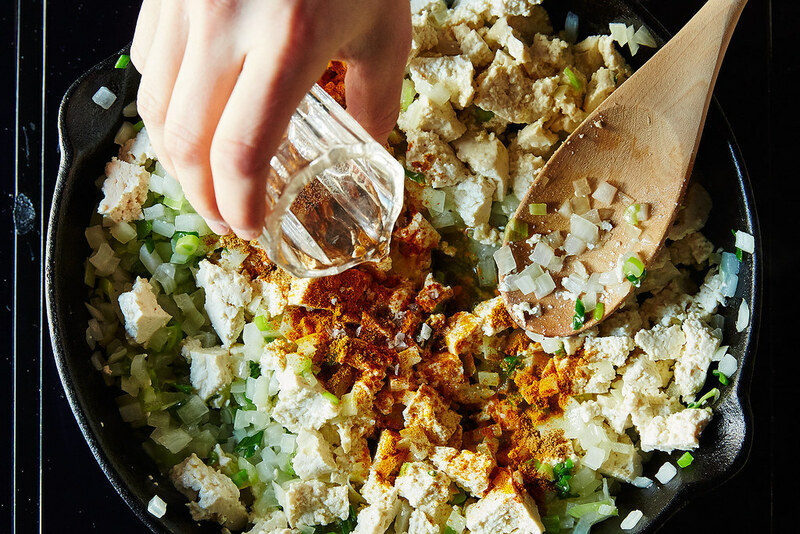 That’s where the tofu scramble comes in: This is how you’re going use the block of tofu you’ve avoided marinating, dredging, and pan-frying for too many days. 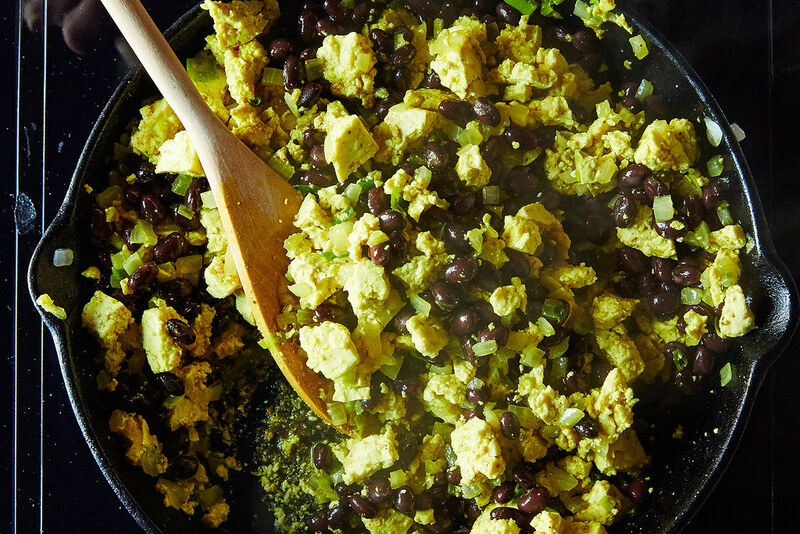 With a tofu scramble, you can enjoy tofu’s slightly mushy, slightly creamy texture as is. It’s not going to pass for scrambled eggs, but it’s a great — albeit different — breakfast (or lunch, or dinner) option for vegans and for those on the search for a new, less involved way to eat tofu. 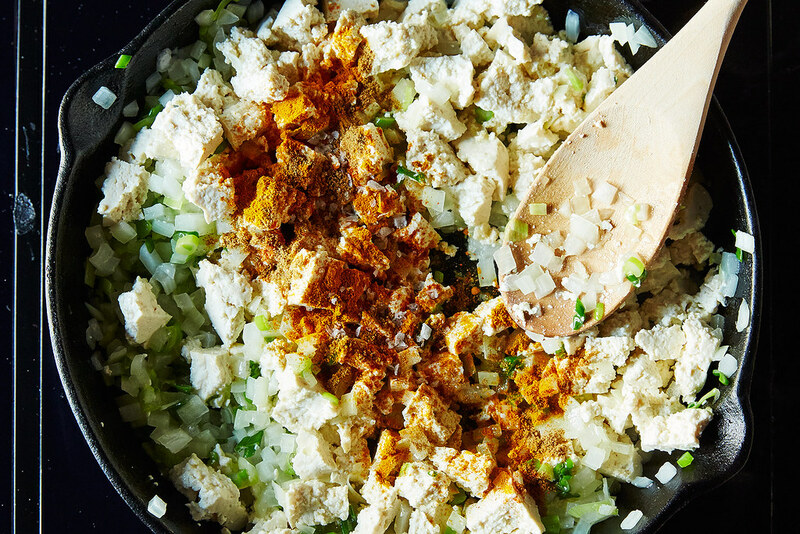 If you’ve never tried a tofu scramble, here’s how to make your first one. Or, if you’re already well-acquainted, here’s how to add some variety to an old standby. 1. Find a block of tofu, then go from there. 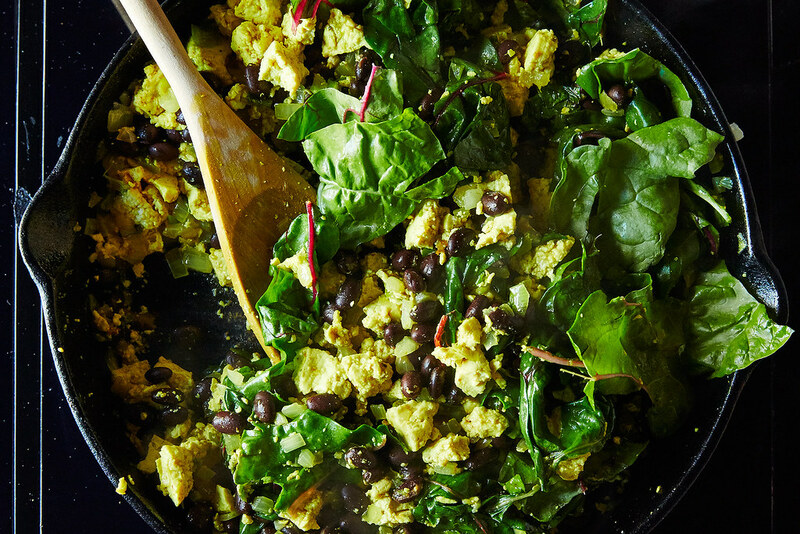 You can’t have a tofu scramble without tofu, so that’s your starting point. Look for the firm or extra-firm kind (other, more silken types won’t retain shape when stirred and sautéed). Depending on how much you bulk up your scramble with additional ingredients, you’ll want between 4 to 8 ounces of tofu per person. If you’re serving four people, go with two 14-ounce packages (you can always reheat any leftovers later). If you have time, slice the tofu into thin slabs, wrap it in paper towels, and press it under a heavy weight — like a cast iron skillet — for about 15 minutes. 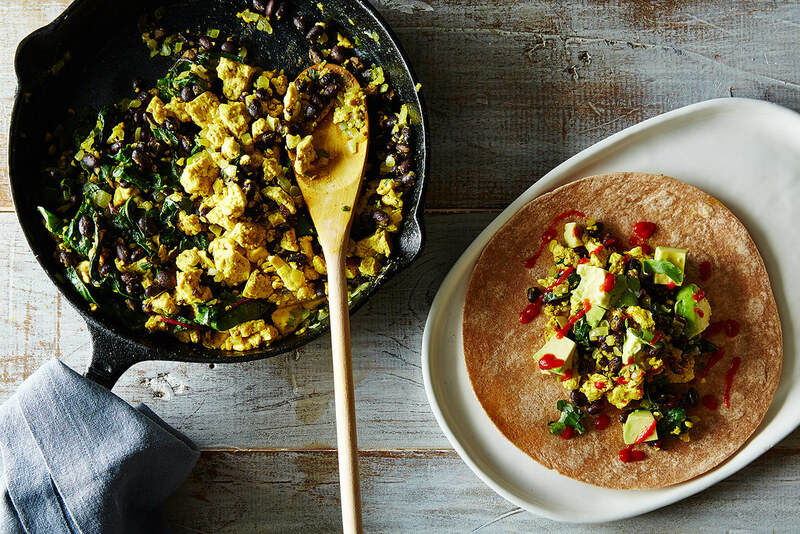 Now it’s time to make your scramble more than just sautéed tofu. 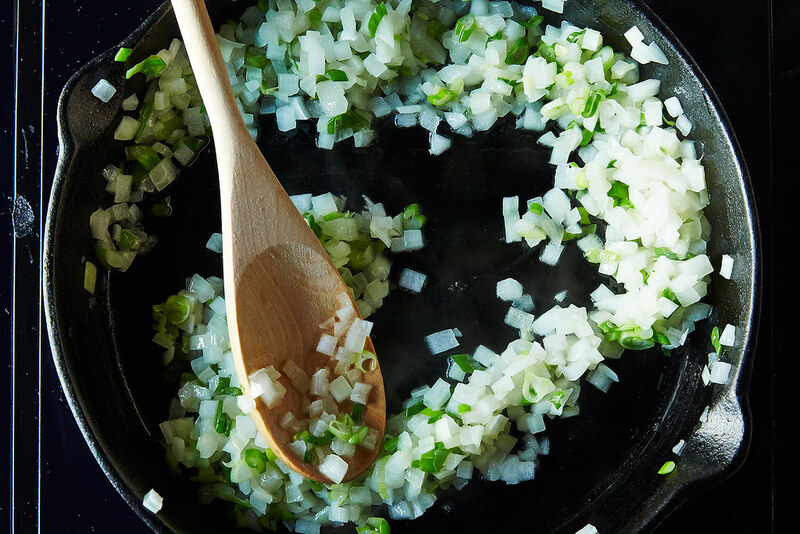 Always make sure to start with aromatics like onions and scallions to build flavor, but other than that, turn to whatever catches your eye at the market or has been loitering in your refrigerator for a bit too long. In the winter, I like to add sturdy greens like rainbow chard (pictured below), lacinato kale, or mustard greens; starches like potatoes, squash, or sweet potatoes; and roots like carrots and parsnips. In the spring, try fresh peas and ramps, and in the summer, tomatoes and corn. Any season of the year, I like adding beans — black, Great Northern, navy (anything small and sturdy) — for textural variation. You’ll need spices for flavor. Here, I used cumin, turmeric, chili powder, and nutritional yeast, but you could also add dried herbs (thyme and rosemary, for example), your favorite curry powder, or even sumac or ground mustard. Lastly, think about how you’ll want to eat your scramble. I never say no to cubed avocado, cilantro, and hot sauce. 2. Ready your ingredients. 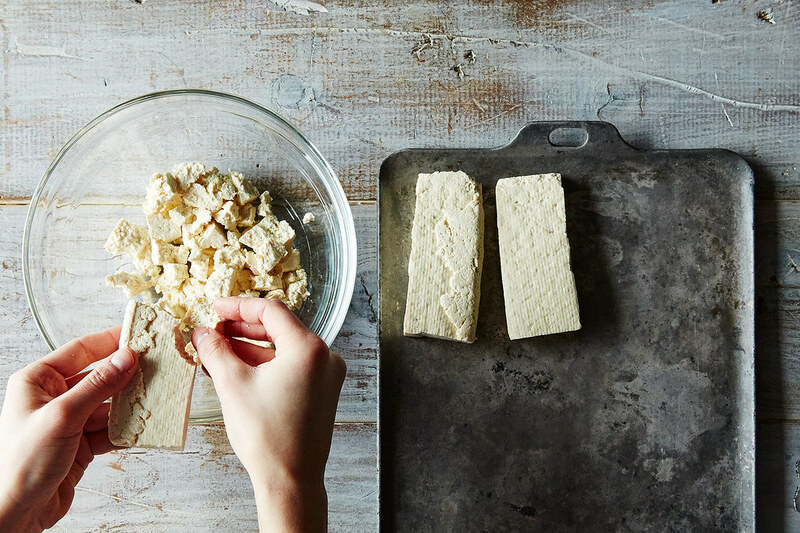 Use your fingers to crumble the pressed (or non-pressed) tofu into small pieces. You could also use a fork or a potato masher to achieve the same effect. Avoid tearing the tofu to shreds — you’ll want to have chunks that are large enough that the outsides will brown while the middles stay creamy. Now get out your knife and a cutting board. Dice or thinly slice the onions, shallots, and/or scallions; mince any garlic you’re using; devein the greens and tear them into bite-sized pieces; and cut any other vegetables into a rough chop. If you’re using vegetables that take a long time to cook — potatoes, squash, sweet potatoes, large florets of broccoli or cauliflower — steam or blanch them before you get started at the stove. That way, you won’t end up with rock-hard potato pieces in your final scramble. 3. Soften your vegetables. Add a couple tablespoons of oil — I use peanut oil because of its subtle flavor and high smoke point, but vegetable oil, coconut oil, or olive oil would all be good choices — to a heavy skillet over medium heat and start sautéeing your aromatics. Cook them, stirring occasionally, until the onions are transluscent and everything is softening and relaxing. Be sure to season with salt and pepper as you go. Now it’s time to add minced garlic, if you’re using it, and any vegetables that need more time to cook and brown (if you steamed or blanched any vegetables, add them now). 4. Now, the moment you’ve been waiting for. When the vegetables are cooked to your liking, dump in the crumbled tofu. Cook for 5 to 10 minutes, stirring occasionally but giving the tofu time to crisp up on the bottom. You can add additional oil if the scramble seems too dry and the tofu is sticking to the pan; it’s also helpful to use a metal spatula to detach any crispy bits that have adhered to the bottom of the pan. If the tofu is losing a lot of water (this is less likely to happen if you’ve pressed it thoroughly beforehand) and it’s pooling at the bottom of the pan, turn up the heat and let the water evaporate. 5. Add the spices. I use about 1 teaspoon of cumin, 1 teaspoon of chili powder, and 1/2 teaspoon of turmeric (mostly for color), but you should adjust the spices to your own personal preferences. Pour a couple of tablespoons of water into the pan after you add the spices — this will help them to dissolve and to evenly coat all of the tofu and vegetables. Season liberally with salt and pepper. 6. Mix in the beans. If you’re using canned beans, drain and rinse them. If you’re using dried beans, make sure you’ve soaked and cooked them completely before adding them. Stir them into the tofu and vegetables and cook until the beans are heated through, another 3 or 4 minutes. 7. Wilt the greens. When you’re just about ready to eat, add a handful or two of torn greens and stir them around until they’re slightly wilted and bright green. You can finish your scramble with a tablespoon or two of nutritional yeast for a savory, cheesy taste. Or, if you have a few carrots lying around, grate them into fine shreds and toss into the scramble for a bit of brightness and crunch. 8. Garnish and serve. I like to eat my tofu scramble taco-style, wrapped in a wheat tortilla and topped with cubed avocado and Sriracha. And, if you’re not a vegan, it’s rarely a bad idea to add some shredded cheddar cheese.